Taurus Car Club of America : Ford Taurus Forum > Official Business > Merchandise > 2015 TCCA TSHIRT SIGN UP HERE!!!!!! 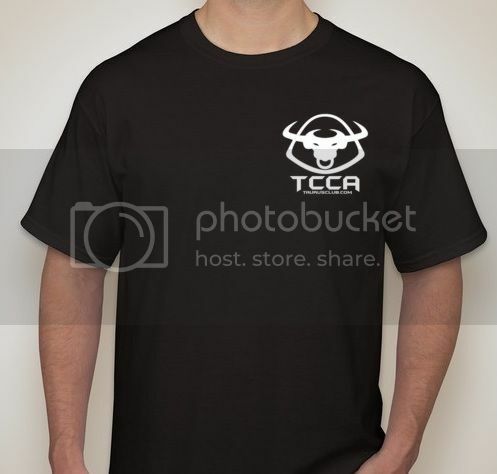 This is the official thread for your 2015 TCCA T-Shirts!!!! Last edited by jag1959; 04-27-2015 at 05:42 PM. I am in for 1 med. Im in for 1 XL!!! Put me down for a Small and a XXXL, Thanks! Would like a MED but can't click on link yet? Thanks, Sam! ALRIGHT! TIME TO PAY FOR YOUR SHIRTS! THEY WILL SHIP EARLY JUNE! Please paypal your total ($15 per shirt plus an extra $1 per shirt sizes XXL or XXXL) to [email protected] - SEND FRIENDS AND FAMILY. If you do not send friends and family please add an additional $2 to cover paypal fees. Thank you!!! Please PM me if alternate payment methods need to be arranged or for shipping outside the US. And the final shirt design has been decided from the voting thread. This is what the shirt will look like!